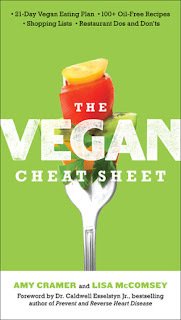 This week's book review is for a book just out this past week: The Vegan Cheat Sheet by Amy Cramer and Lisa McComsey. a take-anywhere resource that puts all the essential information about eating vegan at your fingertips. I like the book. 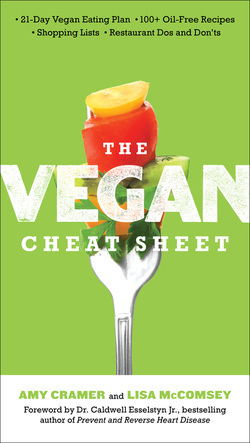 It's one I would recommend to my students and is ideal for someone wanting to move into a vegan lifestyle. It covers all the basics. The recipes are easy and relatively quick. Nothing fancy but there were quite a few that I marked and may make, like chana masala, mushroom risotto, creamy corn chowder. Throughout all the recipes, they don't use any added oil - which is how I cook too. The book isn't gluten free but you can make the usual gluten free substitutions to the recipes. I'm never sure about the 21 day plans...do people really want every meal laid out for them for 3 weeks?? Maybe they do, or maybe they are just examples to play with. The "Party" chapter was a good one - where they group together different recipes that would work well for a gathering. For example, for a 'French gourmet' evening, they suggest their recipes for white bean pate, cassoulet, mushroom risotto, ratatouille followed by chocolate mousse. For 'Passage to India' there is curried butternut squash soup, chana masala, saag paneer, brown rice, whole-wheat pita bread and chia pudding. Like last week's book, this was a quick read. It's a nice introduction to starting a vegan lifestyle and covers all the bases. And its written in a friendly accessible style.